In Mesa, Arizona, citizens have the right to refuse a field sobriety test, as well as an alcohol test involving a Breathalyzer. However, refusal to do so many not work in your favor should you face DUI charges in court. Unfortunately, citizens who are confronted by a police officer and asked to take a field sobriety test do not have the right to consult a DUI lawyer or DUI defense attorney beforehand. Getting a solid idea of what exactly a field sobriety test is, how it works, and whether or not you should engage in one after getting pulled over can arm you with knowledge for the future. What exactly is a field sobriety test? A field sobriety test is an event where a law enforcement officer pulls you over and has you perform certain acts to assess your sobriety. This is often done when an officer suspects that you are driving while under the influence of drugs or alcohol. Field sobriety tests can physically test whether your actions match that of a person who is over the legal legal blood alcohol content (BAC) limit of 0.08%. Should you fail these tests, along with an alcohol test involving a Breathalyzer device, you may be faced with DUI charges. The National Highway Traffic Safety Administration, known commonly as the NHTSA, sponsored research into driving under the influence testing. These standard common field sobriety tests were the result. Officers will use these tests, at the driver’s consent, to assess whether or not to arrest the suspect because of drunk driving. This test is very simple, but may not be so simple for someone who is under the influence of drugs or alcohol. For One Legged Stand tests, the suspected driver must stand straight with one leg lifted about six inches in the air. The officer will instruct the suspect of when to put their leg down. This test allows the officer to assess if the suspect is having trouble balancing, using their arms to balance unnaturally, and keeping their foot from touching the ground. This test is simple for sober people, but a suspect who is drunk may not be able to hold the stance. For this field sobriety test, the suspect must walk a total of nine steps in a straight line. The suspect must want heel to toe, turn around with one foot, and walk back to their original position. This test is in place for an officer to assess the suspect’s ability to balance and follow instructions. A suspect under the influence of drugs or alcohol may step off the line or stumble due to lack of balance. However, this test is considered by many to be a poor test of sobriety because nerves and anxiety may cause a sober suspect to stumble. The name sounds funny, but there is nothing funny about this field sobriety test. This test is in place to assess the suspect’s sobriety by checking for involuntary eye darting that occurs when one looks to the side. This response is normal for a sober person. However, a drunk suspect’s eye darting and jerking will often be much more extreme. An officer will take an object, usually a pen, and move it from side to side. They will instruct the suspect to follow the pen with their eyes to assess if there is any extreme eye jerking. This test is also criticized for its accuracy, because people who take seizure medication or other prescription medication may experience extreme eye jerking at certain angles as a symptom of their medication. In Mesa, if you fail to pass any of the above field sobriety tests, you may be faced with a DUI arrest. If you are informed by an officer of your arrest, you have the right to contact a DUI lawyer or DUI defense attorney in Mesa. A law firm like My AZ Lawyers in Mesa have the expertise in DUI law to help you with your possible DUI charges. 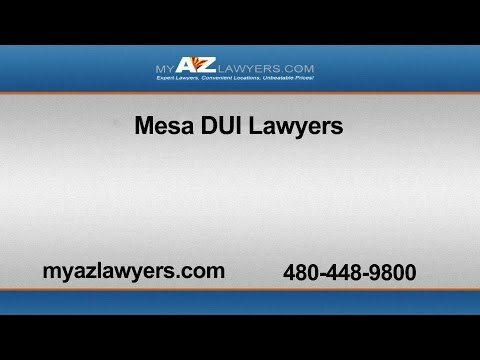 I need a DUI lawyer in Mesa. Where should I look? Look no further than MY AZ Lawyers, PLLC. We are a professional limited liability company that boasts a team of hardworking, experienced, and specially trained DUI lawyers in Mesa that have been offering DUI defense attorney services for many years. Give us a call today to learn more about how we can help you with your DUI case and get matched with a DUI defense attorney that will fight tooth and nail for your rights.